They say two’s company and three’s a crowd. This is especially true when you have the Mr. and the Ex tagging along. Complicated further by unresolved feelings, sexual tensions, and old rivalries, and you’ve got yourself a classic lover’s triangle. But like anything else in the Buffyverse, amp that up by ten. Let’s not forget, Buffy is no ordinary gal, and her suitors are both supernatural creatures of the night. So awkward doesn’t begin to describe the encounter when Angel (Buffy’s former love) arrives to aid The Scoobies and face the news that Buffy’s current flame is none other than frenemy Spike (aka William the Bloody when Angel and he used to pal around, committing heinous acts and leaving a trail of dead bodies in their wake). Throw in some fangs and sharp implements of death and destruction and you’ve got a perfect recipe for disaster – never mind a lively “ex-boyfriend barbecue”. 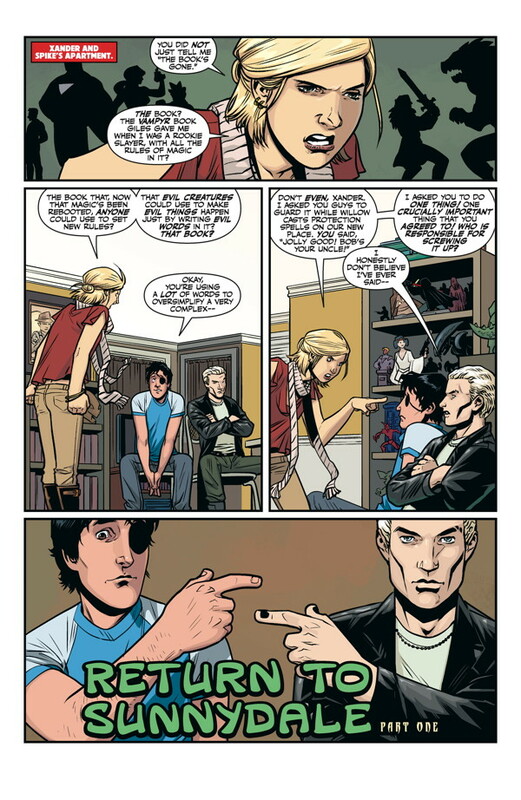 Still, the team must put their differences aside, along with that time Angel killed Giles (good times), among other fond memories, to band together, bringing their collective mojo to defeat the evil Archaeus, a demon which has been attempting to control soulful vamps, and rivals for Buffy’s affections, Angel and Spike. What happens next will leave you on the edge of your seats, as any good crossover event should do, with a cliffhanger that will have you crying “Noooooo!!! !” to rival Shatner’s “Khaaaaaaan!” in Star Trek 2: The Wrath of Khan. Ok, maybe that’s a little bit over-dramatic, but I got your attention, didn’t I? If you’ve been staying with Season 10 of Buffy, don’t turn back now, pick up Buffy the Vampire Slayer Season 10: Issue 17, out today, at a comic book store near you! For more on Buffy the Vampire Slayer Season 10 and Angel & Faith Season 10 from Dark Horse Comics, check out my reviews at Skeletonpete.com. I’ve always loved a good crossover. That’s just something the nerd in me can’t resist. I would become super excited as a kid whenever The Six Million Dollar Man and Bionic Woman would have a crossover event. An episode would start on one show and end on the other. It’s still true now, I geek out whenever The Flash makes an appearance on Arrow (and vice versa). And it always worked for Buffy and Angel, even when they were on different networks, just like it did for that other super-couple Jamie Sommers and Steve Austin. Bionic duo and former lovers Steve Austin aka the Six Million Dollar (Lee Majors) and Jamie Sommers aka the Bionic Woman (Lindsay Wagner). When Angel (repentant vamp and Buffy’s former love) left Sunnydale all those years ago, we knew he’d be back, and likewise, Buffy wouldn’t (couldn’t) stay away from him either. With dark slayer Faith (portrayed in the series by Eliza Dushku) traveling back and forth between both shows, there was always a bridge, and always a chance for a crossover event. Angel even shows up briefly during the Buffy finale. 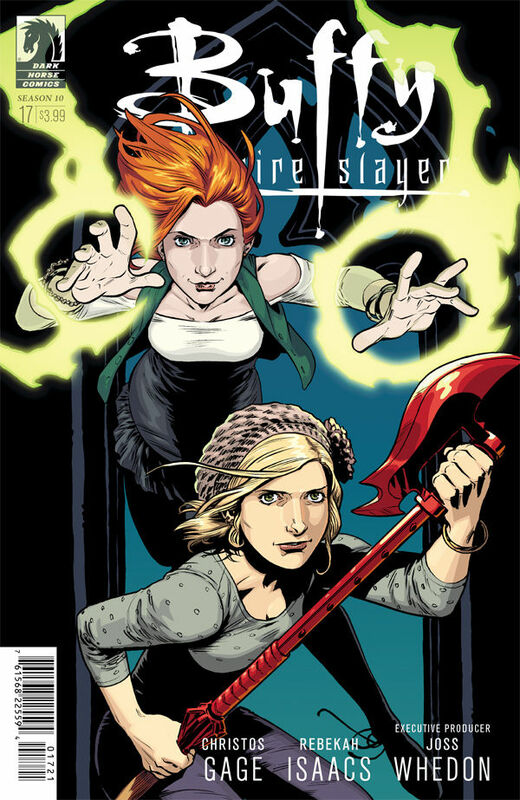 Is it any wonder then that the writers of both Buffy the Vampire Slayer and Angel & Faith comics have teamed up to create a season that allows each series its’ own arc, while still letting one be part of the other’s story as well. 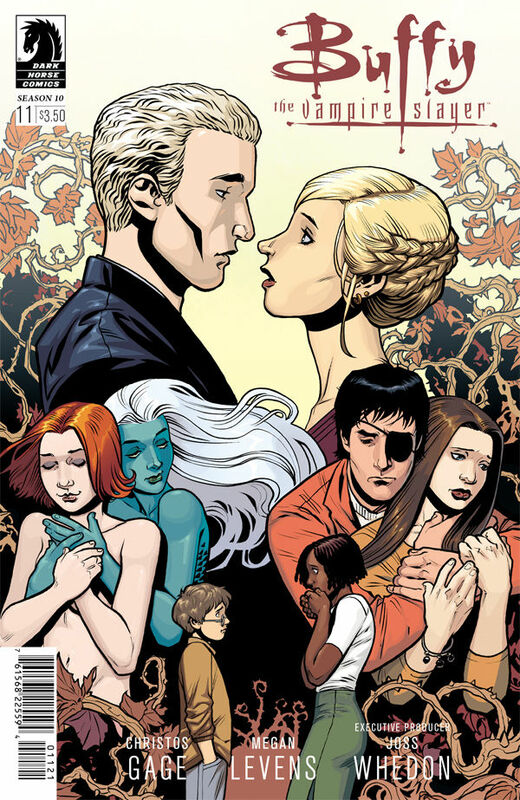 Ever since the “Love Dares You” arc, starting with this season’s eleventh issue, Buffy and Spike have reconnected romantically, and after many long years of waiting, fans let out a sigh of relief (myself included). Of course, hi-jinx must ensue when Angel is called, by none other than Spike (Buffy’s other on again/off again/currently on again beau) to aid in their latest fight against Archaeus, an ancient demon who has been tormenting both Angel and Spike. There is way too much history between these three, going back to when Spike was sired (turned into a vampire for the newbie) by Drusilla (who was sired by none other than Angel). There was a whole lot of siring going on back then. Oh, those wacky vamps! Of course, there’s no time to wallow in hurt feelings and awkward silences when there are demons to slay, and the old team bands together to do just that, in their own unique fashion. Equipped with banter aplenty and sharp and pointy implements of death and destruction – not to mention a whole lot of hacking and slashing – they get to the task at hand. However, it’s just the beginning for our Scoobies, and the big bad for this season has yet to be dispatched. After all, what would a crossover event be without a cliffhanger? As always, the team of Christos Gage and Rebekah Isaacs aim to please and do not disappoint, and Steve Morris’ cover art always impresses. While each series can stand on its own, do yourself a favor and pick up both Buffy and Angel & Faith Season 10 books. They’re even more fun together. 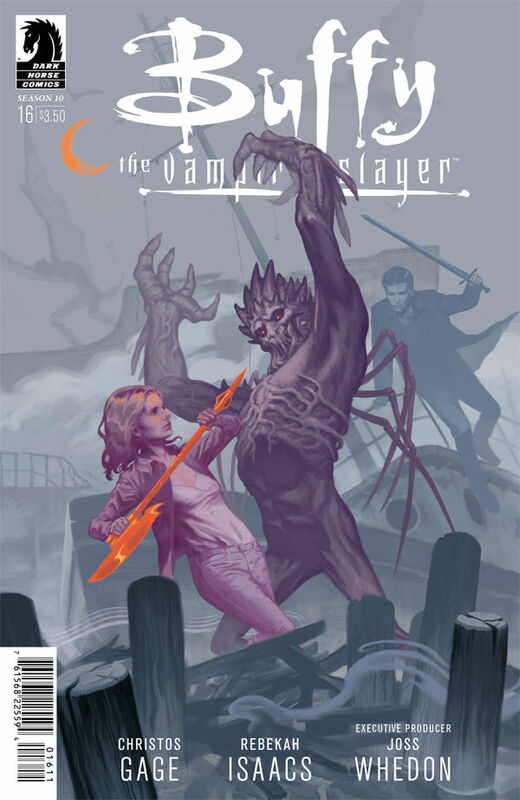 Buffy the Vampire Slayer Season 10: Issue 16 is due out tomorrow, June 17, 2015! Get it at a comic book store near you! They say the path of true love never doth run smooth and roses have their thorns… Cliche, but true, and quite the understatement for Buffy and her friends. Relationships are complicated at best, and romantic relationships are probably the hardest thing to get right, for anyone… For vampire slayers and demon hunters, this is doubly true. 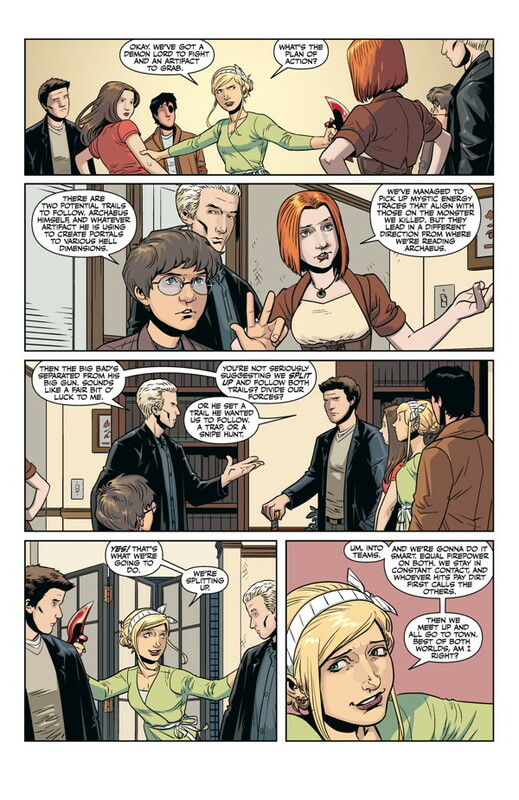 Complications abound and hi-jinx ensue when Buffy and the Scoobies find a little down time to examine their feelings and their broken relationships. With the rules of magic being re-written (with Willow’s help) and the world more aware of its presence, you’d think it’d make life a little easier, right? Of course, no episode (or issue) of Buffy can be completely angst-free, and at some point, this issue’s big bads have to surface. For once, I’d say they’re almost welcome. 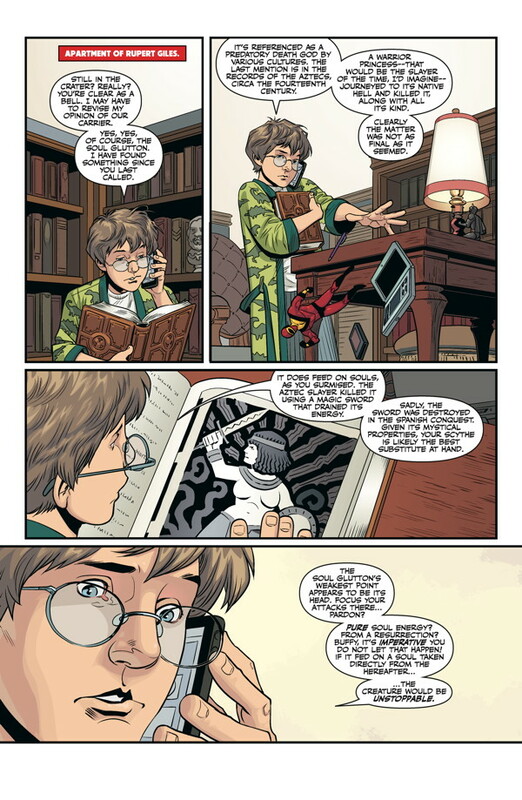 Meanwhile, a Harry Potter-like, 12-year-old Rupert Giles continues to struggle with his second adolescence. Painful enough for any pre-teen, but never mind a pre-teen with a middle-aged man’s memories… Memories of a full life and lost loves. A second childhood might be welcome to some, but not for him. Poor Giles hasn’t had much luck in the romance department either, and when an old flame shows up, things go from bad to mortifying. How many ways can we spell awkward? However, the script seems to flip for our resident uber-geek and reformed super-villain, Andrew Wells (portrayed in the series by Tom Lenk). When did he get a life? I must have blinked and missed something. 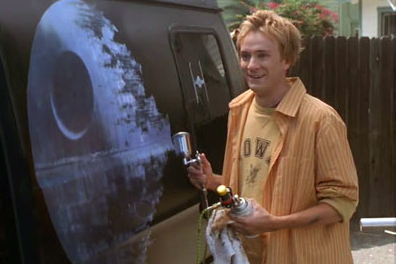 Andrew Wells (Tom Lenk) during his “super-villain” phase (note the Death Star on the van). 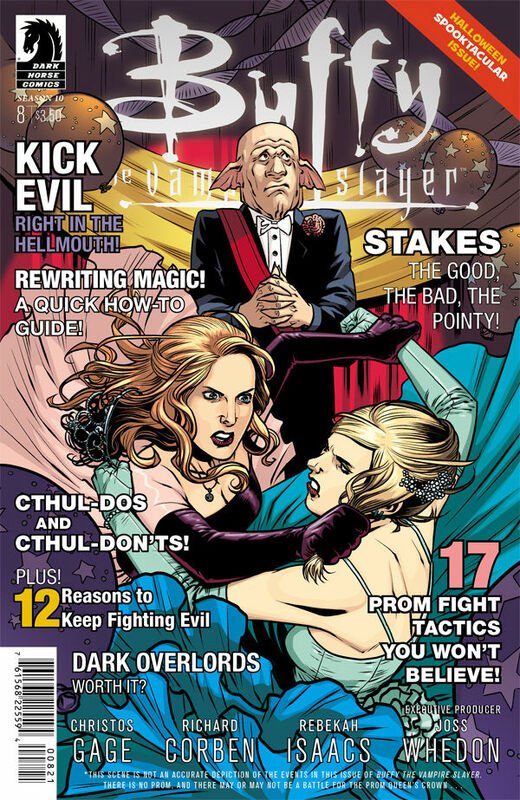 Issue 11 is classic Buffy fun (Christos Gage masters the Whedon/Buffyverse voice), with more than a few moments that are reminiscent of some real life dating horror stories I’ve heard friends recount. Including the indignity of speed dating (which I can gladly say I’ve never had to endure). I’ve only ever heard it work out for one couple I know (ah bless). Of course, the ending, though not surprising, will be satisfying for most fans (including me), however, with Part 2 (and Valentine’s Day) on the horizon, I can’t allow myself to be lulled into a false sense of security. This is the Buffyverse, after all. For this installment, artist Megan Levens replaces Rebekah Isaacs (who provides the Issue 11 variant cover), and Megan does a great job picking up where Rebekah left off. 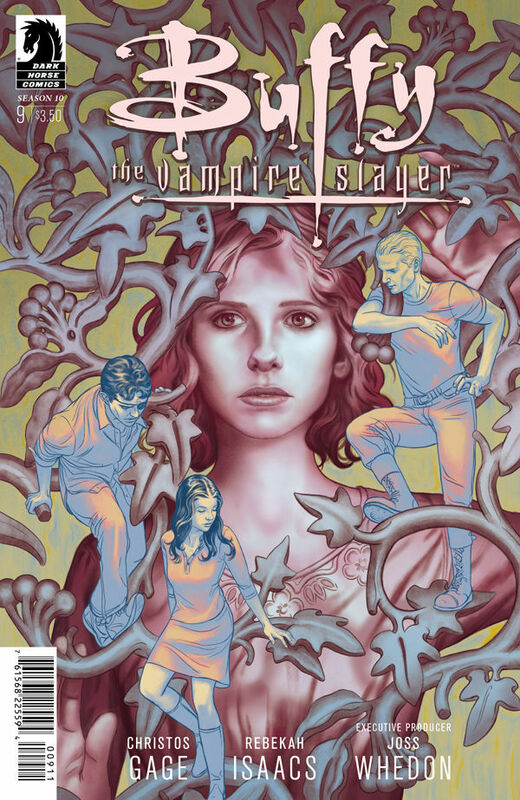 Buffy the Vampire Slayer Season 10: Issue 11 is due out tomorrow, Jan 21, 2015! Get it at a comic book store near you!